Typically, when veteran pitchers suddenly start being good, I’m pretty skeptical, more so than I would be if they were a younger pitcher. 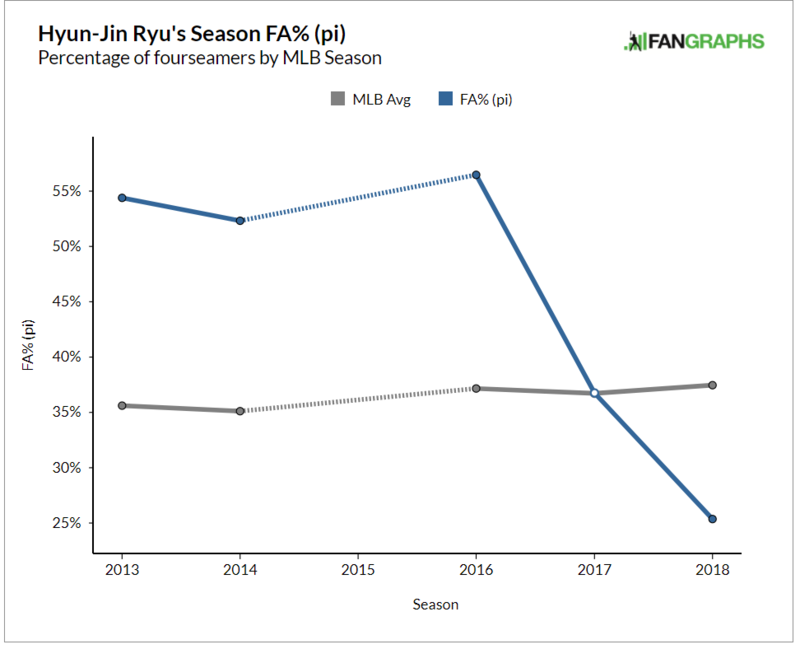 But that doesn’t mean that older pitchers don’t make changes that lead to success, and that’s exactly what Hyun-Jin Ryu has been doing so far this year. When you look at Ryu’s stats so far this year with his peripherals, it’s hard to say that this has all been a product of luck. He’s got a 1.99 ERA, 0.88 WHIP, 2.67 FIP, 1.99 bbFIP, and 3.31 kwFIP. Now, yes, he does also have a .200 BABIP, but I wasn’t exactly expecting him to maintain a sub-2.00 ERA anyway. So the next question then is, what is Hyun-Jin Ryu doing differently? It turns out, quite a bit. He’s been toying with his repertoire and gained better control of his pitches, which has been key to his success. 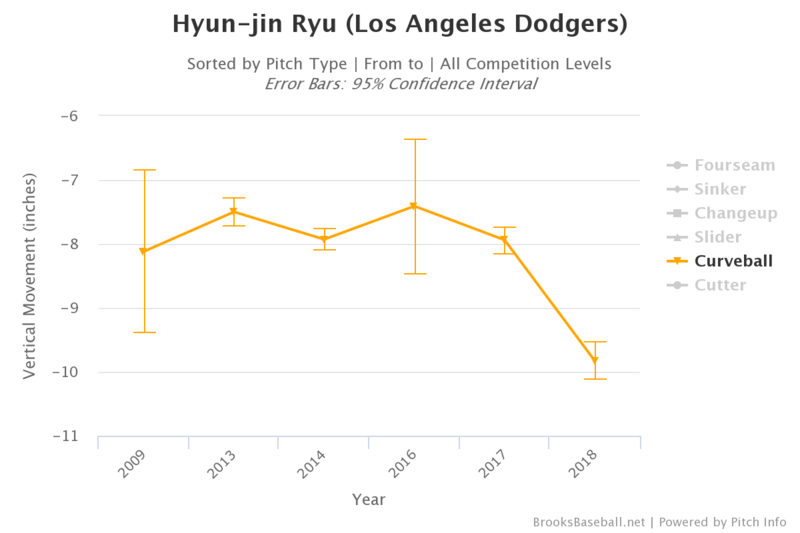 Let’s take a look at what Ryu’s repertoire has looked like so far this year (because what is a Pitcher List article without GIFs? I would never do that to you). It’s been a pretty garbage pitch in the past. Like, it had a -21.6 pVAL last year, it was that bad, and that mostly stems from the fact that he’s had trouble controlling it, throwing it in the zone just 50.5% of the time last year (which is pretty bad for a fastball). It’s not a strikeout pitch, it’s a setup pitch, which is why it needs to be controlled. So far this year though, Ryu has been controlling it significantly better, throwing it in the zone 59.1% of the time, which is why it’s got a 4.9 pVAL on the year. That’s the first time he’s had a positive pVAL on his fourseam since 2014. It’s also actually producing a decent 11.4% whiff rate too. Instead, he’s using his cutter. As far as cutters go, it’s a fine pitch, coming in at about 87 MPH on average with decent movement. It’s been successful though, as hitters are slashing just .143/.217/.333 against it. Along with his increased use of his cutter, Ryu has also added a sinker for the first time in his career. He hasn’t thrown it a whole lot, and he’s had some trouble controlling it, but it’s worth noting that he has added this as a new pitch to his repertoire. It’s a biiiiiiiig slow hook of a curveball, coming in around 74 MPH on average and dipping as low as 69 MPH sometimes. It works fairly well as a strikeout pitch, generating an 11.7% whiff rate last year, but he’s had trouble controlling it, throwing it in the zone just 39.2% of the time last year. Ryu’s curveball now has the most vertical drop on it that it’s ever had in his career, almost four inches more drop than it had last year and about four-and-a-half more inches of drop than your typical curveball. So not only is he controlling it better, it’s dropping further than ever before. That’s why I’m actually encouraged that he’s barely throwing the pitch this year, throwing it just five times so far this season. If he’s realized how weak the pitch is and that he doesn’t necessarily need it with his re-tooled repertoire, that could be good. So what’s the overall takeaway here? 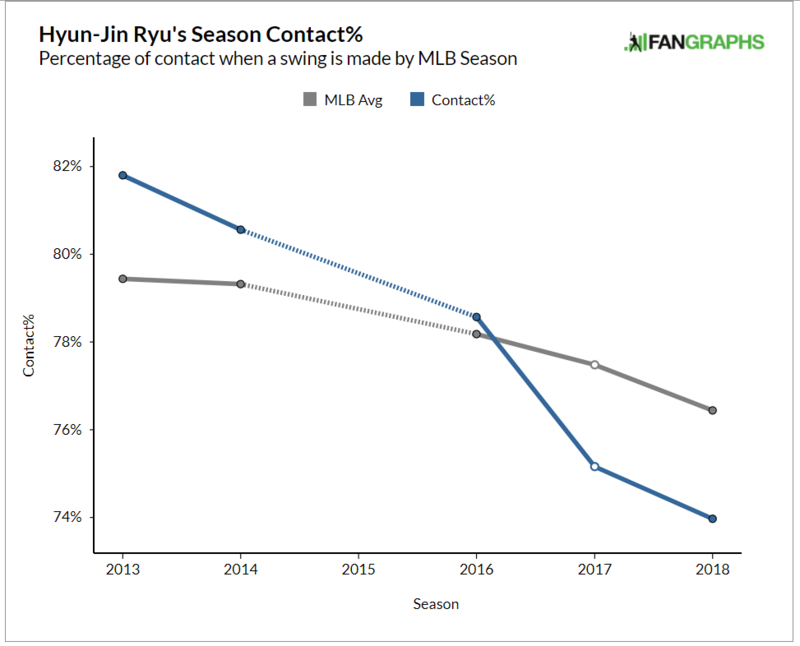 Well, it’s this — Ryu has toyed around with his repertoire, adding movement to his curveball, decreasing the usage of his mediocre four-seam, and increasing the use of his cutter, all while controlling his pitches significantly better. The two are very interconnected, and that, along with his peripherals suggest to me that this is more real than it isn’t. And yes, stop yelling at your computer screen, I haven’t addressed the elephant in the room — his health. Ryu started 24 games last year, and I think he could get to that mark again, perhaps even better. 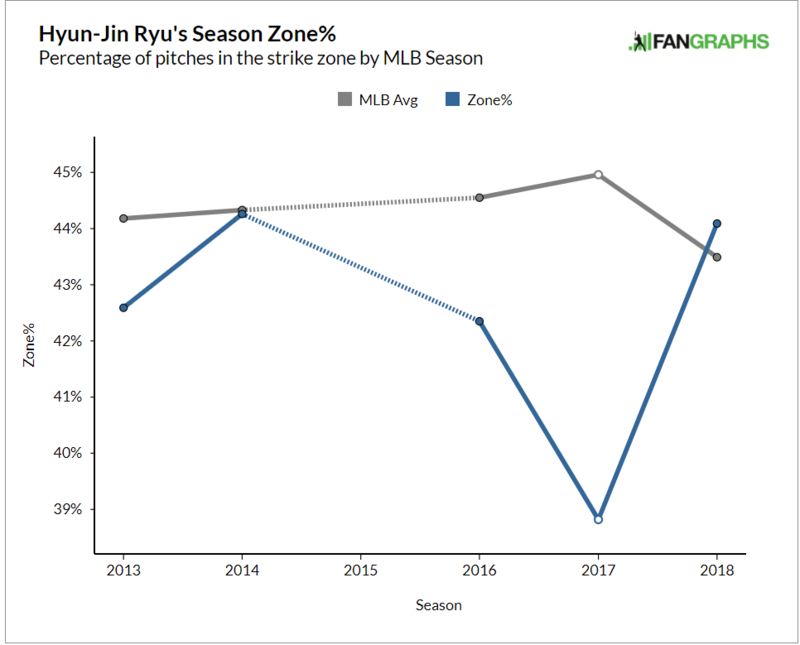 I don’t necessarily think that Ryu is going to have some kind of insanely good year, but as long as these changes stick (and I think they will) and he stays healthy, I could see him with an ERA in the mid-3s with an above-average K/9, and I think that’s certainly a useful fantasy asset. Great article and analysis Ben! I was kinda hoping for something like this after I saw Ryu wasn’t listed on last week’s Pitcher List and then came in low this week at 82. Thanks! And yea, I think Nick’s a bit more skeptical on him than I am, though not by a ton. Well the skepticism is probably a little warranted by Ryu’s health and the way the Dodgers seem to game the DL10 system. I was actually just looking at the Dodgers upcoming schedule to see who he faces after the Giants this weekend, only to find out they bumped his next start back to Tuesday. Guess that is something you have to factor in as well, the additional rest as they try to keep that rotation healthy. Yea, that’s definitely an understandable hesitation. But as long as he’s healthy, I’m happy rolling him out there for now. Hey Ben, looks like I’ve got a dynasty offer on the table where I send away Willie Calhoun and Nate Pearson and receive Ryu and Reynaldo Lopez. I like Lopez because he can jump back and forth between my major league and minor league rosters for the next few months until he hits 200 IP. Ryu would bolster my staff and give me the possibility of trading some pitching away for a bat, or dominate. My staff is Kluber, Price, Godley, Manaea, Taillon, Shark, and Quintana. Initially was only interested in Lopez, ryu is the throw in. What do you think? I like Lopez a lot, but I don’t know that I’d do that deal in a dynasty league. You’re giving up two guys with a lot of potential for one guy with a lot of potential and a solid right-now pitcher with an injury history and a limited future. I’d prefer to hang on to Calhoun and Pearson, especially given that you’ve got a fairly solid pitching staff already. What a great article! Adding cutter more, which it has similar velocity to his fastball, confuses the hitter. And I see his swagger with his fastball, finally feeling confidence in his elbow.